OPENING RECEPTION: ECHOES OF CONVERSATIONS. 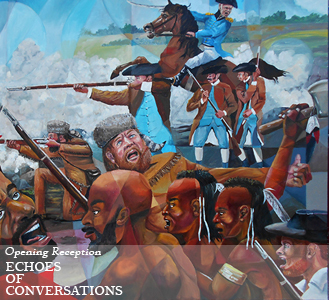 Join us at the opening reception of, Echoes of Conversations a tribute to black Americans in art, literature, and poetry featuring the art of celebrated Nashville artist, Michael J. McBride. This event is FREE and open to the public. MEET THE ARTIST: Guests at the evening’s event will have the opportunity to meet the artist and explore the deep roots and impact of Black Americans past and present and how their contributions have helped to shape conversations in America and the world.